Skip the trip to your neighborhood mini mart on those sweltering summer days. Make your own slushie at home! 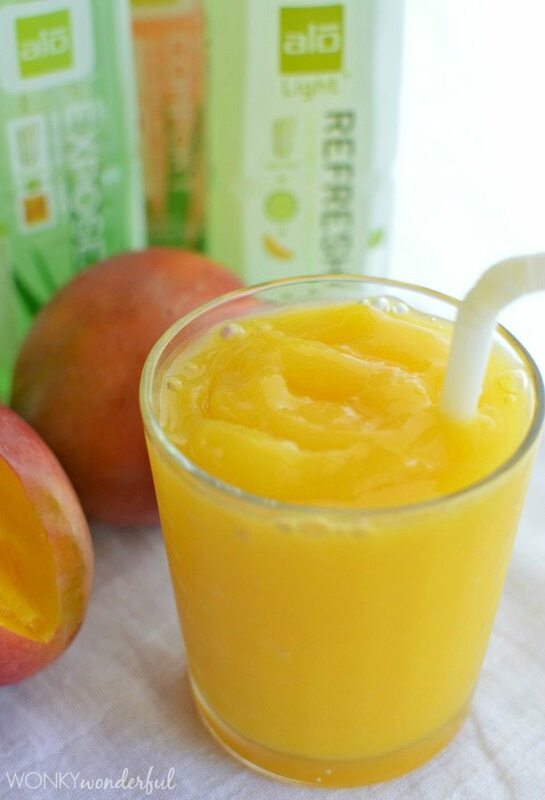 This Mango Slushie Frozen Drink is natural, healthy and bursting with flavor! Is it HOT where you are? Here in Northern California the summers can be a bit extreme. After awhile plain water just does not quench my thirst. I’m always looking for a refreshing beverage to enjoy. 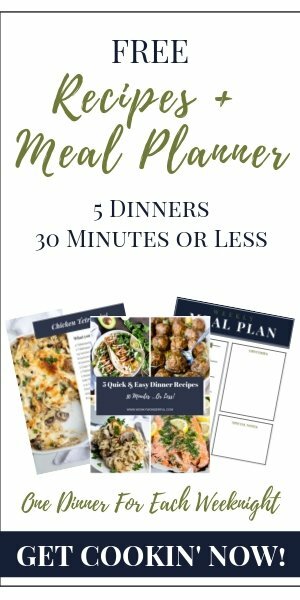 I was super excited to try a variety of ALO Website! ALO is a natural beverage made from real aloe vera pulp. It is low in calories, gluten free, fat free and made from real aloe pulp that comes from an organic aloe farm. Oh, it’s also my new favorite drink! Along with this Mango Slushie, of course. 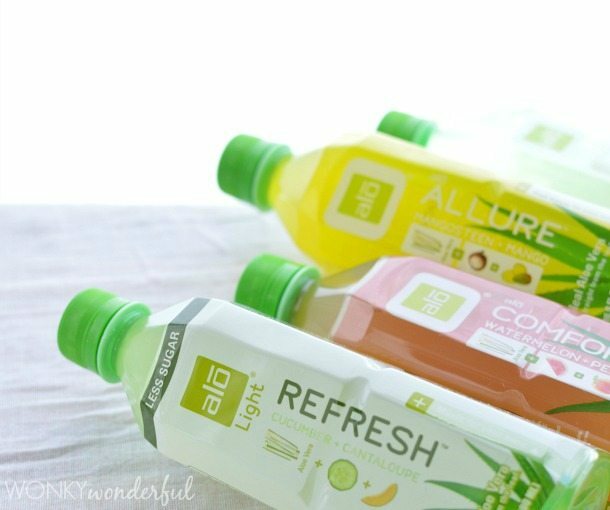 ALO offers three different drink lines available for purchase: 9 Flavors of ALO Original, 3 Flavors of ALO Light and 2 Flavors of Coco Exposed. My favorite is the ALO Original Aloe Vera and Honey. It is clean and refreshing. The crisp flavor is perfect for quenching my thirst in 100°! ALO was the first aloe vera beverage to receive the Non-GMO project verification. Made with real aloe vera pulp, straight from the leaf, never from powder. Find out more at the ALO Website or ALO Facebook. Puree ingredients in blender until completely smooth. ALO is also offering access to music. On every bottle of ALO Drink, there is a QR Code that leads to a specific song that was made for that flavor. This sounds delicious Nicole!!! I love easy fruity recipes — and ALO sounds great!! Good lord Nicole if this isn’t the most beautiful slushie ever! Love mangos, they are such a treat! Maybe I’ll try a mango banana smoothie! Yum! That sounds wonderful. Enjoy! definitely the mango! i will pretend im in a tropical location while sipping it! and feeling healthy all at the same time! 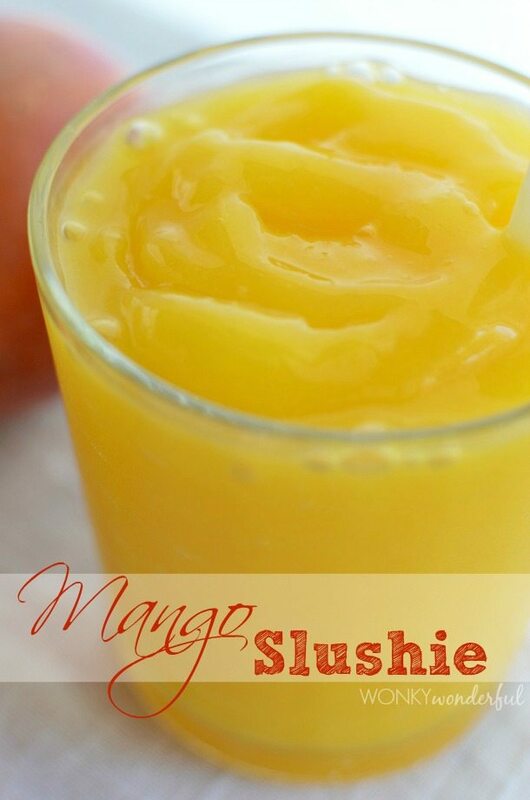 I would definitely make the mango slushie with ALO. Looks so refreshing. I would make the Aloe Vera Honey slushie with ALO. It sounds wonderful to drink and great for you so there is no way to go wrong. I would love to make mango strawberry! The mango sounds incredible! I want to make everything! I would love to try the watermelon + peach Thanks for the chance! This is definitely a flavorful smoothie. Enjoy!